Our Little Family: Bryson's 3rd Haircut! Rachel brought her shears with her and gave Bryson his 3rd haircut! 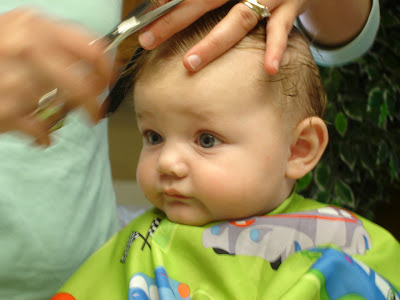 How many 5-month-olds do you know that have already had three haircuts? You would not believe how fast Bryson's hair grows! It was about four inches long on top but she cut it down to about one inch. It's adorable!! !